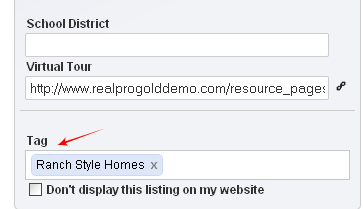 3) Click the edit icon next to the property you would like to tag. 4) In the lower left corner you will see the Tag section. Add one or two words to help identify the property such as 'pool', 'luxury', etc. You will need to use this exact word or set of words for each property that you would like to include on the page with the one you're currently tagging. 5) Add a name for your page. 6) Choose the word or set of words you used in the listing Tag field from the dropdown menu. 8) Add a description of the page here. The description will appear at the top of the listing page.